Interesting contrast between Go Ahead and First Group at the moment. Go Ahead aiming to grow whilst First seem intent on cutting right back, concentrating on a few areas very much at the expense of other areas. You can clearly see this happening in Plymouth at the moment! Roger French, Managing Director of Go-Ahead's Brighton and Hove Bus and Coach Company is to retire next year after overseeing the operation of buses in the south coast city for 30 years. 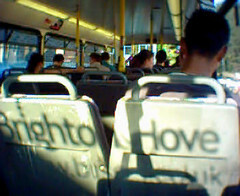 Since 1982, when Roger first moved to Brighton, the bus market in the city has grown significantly, with the number of journeys made by bus doubling in the last 20 years. David Brown, Group Chief Executive for Go-Ahead said: "Roger has been amazing in the innovative way he has grown the business. He has been instrumental in giving the city the excellent bus network it has today. He deservedly received an OBE for services to public transport seven years ago. "Roger has inspired his team to deliver a high quality service to passengers and has spent much of his career developing successful partnerships with the local authority and other key stakeholders – partnerships which are rightly hailed as a beacon for others to emulate. "We will miss Roger, his extensive experience and unique approach immensely. He can retire safe in the knowledge that he will leave behind him a legacy of excellence which will be recognised for many years to come, not just in Brighton and Hove but across the wider bus industry." Roger chairs Brighton and Hove's Local Strategic Partnership; the Brighton and Hove Business Forum; the Hove Business Partnership; the Chamber of Commerce Executive Committee and the Martlets Hospice. Roger is also a member of the city’s Economic Partnership, the Transport Partnership and the Hove Business Association’s Management Committee and is a Trustee of the Argus newspaper’s charity, the Argus Appeal. In addition to an OBE in 2005 Roger received an Honorary MA from the University of Brighton in 2007. He became a Deputy Lord Lieutenant for East Sussex in 2007. During his retirement, Roger plans to spend time pursuing his interest in travel and transport in the UK and abroad. The Go-Ahead Group will commence the search for a replacement for Roger shortly. Its clear within the industry that Mr French is well respected and the company he runs is much admired. I am sure there will be a few senior managers within Go Ahead looking at what seems to be a plum job!